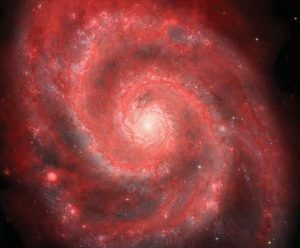 The Whirlpool Galaxy is a spiral galaxy like our own Milky Way Galaxy. Spirals are known for their non-stop star births and deaths, seen here in (false color) pink by the VLA. A galaxy is an island of stars floating on a plate of dark matter, or so the theory goes. Dark matter helps cram clouds of gas together to form a black hole anchoring system that gathers more and more mass into orbit around it. Jumbles of gas and dust stick together, become attractive piles of mass for more gas and dust, and soon stars are born in a disk of material whirling around the black hole in the center of it all. Repeat across hundreds of thousands of light years, and a galaxy is formed. Galaxies come in all shapes and sizes, colors and activity, and astronomers classify them accordingly. We have spirals, ellipticals, dwarfs, blue compact dwarfs, cannibals, peculiars…the list goes on. Our Milky Way Galaxy is a barred spiral galaxy, a hundred billion stars slowly moving around in a disk around a central supermassive black hole core. Spiral galaxies get their name from the alternating bright starry and dark dusty lanes that seem to swirl into a center. The lanes are not actually falling inward, but are the snapshot of a traffic jam from billions of years ago that is still causing the dark fender-benders that make bright new stars. The ability to make new stars in such abundance is often associated with a galaxy’s youth. Spirals are considered, in the latest theories, to be the first phase of galaxy evolution. Their aging process is dramatic and unstoppable. Galaxies rarely grow in isolation of each other, and they are constantly on the move throughout the Universe. In fact, most of them travel in packs, thanks to their dark matter connection, with galaxies so near to each other that collisions are frequent. Spiral galaxies passing by each other distort and disrupt each others’ arms, yanking away loads of gas that could have fueled the making of new stars. Typically, the near miss triggers the two galaxies to be forever locked together in an increasingly more intimate dance that eventually results in their merger. In truth, galaxy mergers are spectacles in all wavelengths. As the two cores pass closer and closer, chaos replaces order, and once organized gases and dust lanes of the swirling arms are kicked out of place. Their matter’s nature is to draw closer to the nearest largest gravity source, which is often each other. When they collide, surges of star formation are triggered, and the two galaxies light up with new stars that dazzle optical and infrared telescopes. Models of mergers suggest that the central black holes of each galaxy are also the benefactors of this released fuel. These monsters gorge on the glut of loose gas, releasing enormous jets of energy and particles from their magnetic poles, transforming the merging beast into an active galaxy that dazzles radio and X-ray telescopes. The VLA and the VLBA monitor these huge jets pouring out of hundreds of galaxies around the Universe. The Antennae Galaxies are a pair of spiral galaxies that collided hundreds of millions of years ago. Many spiral galaxies end up in mergers like this one, with a fury of star formation that is especially bright in radio waves. When a galaxy merger finally settles down, the spirals have become well mixed. Much of the two galaxies’ star fuel has been either stripped off or forced out by the winds of its new, giant stars and the wasteful gorging of its new, powerful black hole. The regularly-spaced, gravitational relics of their arms’ ancient traffic jams are lost, and the new, big galaxy has no organized star formation routine left. The stars made by the merger of the spiral galaxies are likely to be the last generation of big stars this galactic mishmash can make. Spiral galaxies that have not experienced mergers can also suffer this loss of star-forming gas — we call these starburst galaxies. 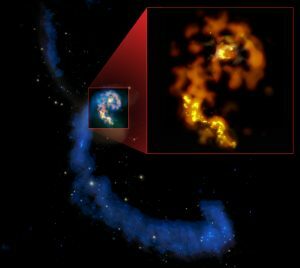 We remain unsure as to how one galaxy can make 100 times more stars a year than its neighbor, but ALMA data have revealed that it may have to do with a smothering environment around the starforming gas and dust. The less chance the material has to float away, the more it can be yanked into making stars. What’s fascinating is that, of course, the flood of new stars has powerful radiance, and their polar jets do a great job of sweeping away material out of their north and south magnetic poles. So, although a starburst galaxy can make a lot of stars in a very short time, it doesn’t get a lot of time to do so, and soon a starburst galaxy is also devoid of gas and left with its last crop of stars. Many of the galaxies near to ours are in this final resting stage. With ALMA, we have caught one of them in the act of draining its fuel. We see an enormous geyser of hydrogen and heavier elements forcing their way out of this galaxy’s core. With ALMA, we also spot the Universe’s first gas-drained galaxies. Their light is redshifted as the fabric of space beneath them has carried them away with its expansion. The shift of their light is enough to slip their wavelengths into ALMA’s submillimeter-wave territory, and we see dozens at a time. Our own galaxy is still young, still happily making stars and planets in its arms, and its central black hole is nearly starved of fuel. The GBT has seen clouds of gas streaming toward the Milky Way from its small companion spirals, the Magellanic Clouds, proof that our Galaxy continues to find sources of fuel for its star-making. And the GBT monitors Smith’s Cloud, an enormous pile of hydrogen that is hurtling into our Galaxy, and in less than 30 million years, will provide us with enough gas to make a million suns. However, when our VLBA clocked the motions of the clouds and dust in our neighbor spiral, Andromeda, it found a startling truth: we’re on a collision course. The better we understand this phase in the evolution of other galaxies, the better we can predict this next phase in our Galaxy’s own. But don’t mark your calendars: the collision won’t happen for another four billion years!